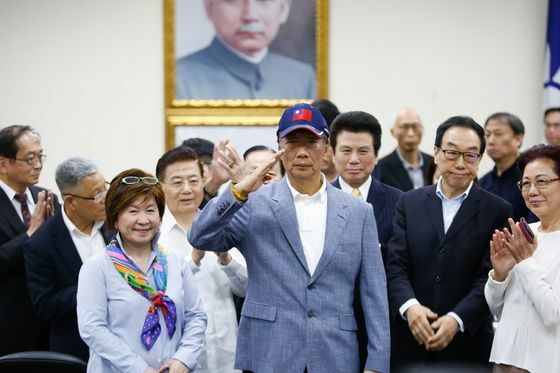 (Bloomberg) -- Foxconn founder Terry Gou announced Wednesday he’s running for Taiwan’s presidency, shaking up a race that will determine whether the island moves closer to China. Earlier in the day, Gou claimed a divine endorsement: support of the Chinese sea goddess Mazu, who he said had encouraged him to “come forward” to support peace across the Taiwan Strait. “Today, Mazu told me I should be inspired by her to do good things for people who are suffering, to give young people hope, to support cross-strait peace,” Gou said, adding that the goddess had recently spoken to him in a dream. “I came to ask Mazu and she told me to come forward.” Gou visited another temple housing Chinese deity Guan Yu. Gou’s entry in the race further clouds the future of Tsai, who already has an uphill climb to win re-election. She faces her own nomination fight in the DPP, where her pro-independence base is pushing for a cleaner break from the mainland. To shore up support, she’s recently cracked down on mainland investments, as well as visitors and other potential sources of political influence. Tsai has also held a series of events with China hawks in the U.S., in which she’s sounded the alarm about Communist Party “coercion” and urged greater military support from Washington. The race comes against the backdrop of increased pressure from Beijing, with President Xi Jinping suggesting earlier this year that mainland China and Taiwan should enter into “in-depth democratic consultations” on unification. Gou has no clear successor, and the announcement raises questions about how the company will be run. Reuters reported Monday that he plans to step down as chairman of Foxconn “in the coming months.” Louis Woo, his special assistant, later told Bloomberg that while Gou would be stepping back from operations and focusing on strategy, he didn’t plan to relinquish his chairmanship. “Mazu said the economy would improve following peace and prosperity,” Gou said, adding that he believed the goddess had long supported his business success.